Some games get very little coverage before release. Some games get announced very close to their actual release in order to minimize the conscious waiting that the public has to do. 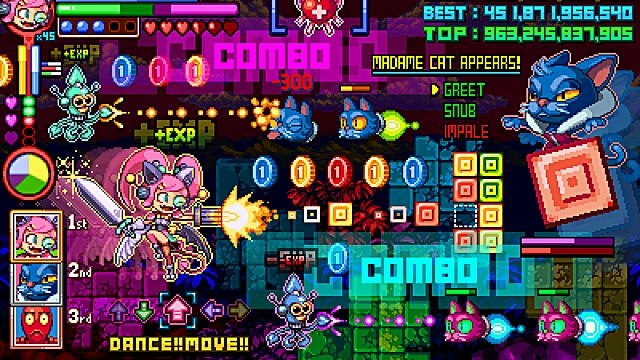 Then there are games like Cat Girl Without Salad: Amuse-Bouche, which started life as an April Fools joke. It was first announced through a single picture posted by Humble Bundle on Twitter, and this was done one week before it's release. 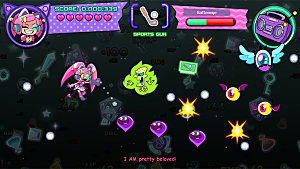 On April Fool's Day of 2013 developer WayForward Technologies released a fake sprite sheet of a game titled Cat Girl Without Salad and claimed that it would be available for literally every platform possible at the time at a later date. This was of course, a lie... mostly. The impossibly complicated screenshot was nothing more than a joke, but nonetheless, people began clambering for a real version of Cat Girl Without Salad. For the longest time this seemed like nothing more than a pipe-dream, until that previously mentioned announcement happened in May of this year, revealing the game's Humble Bundle Monthly exclusive release. Seeing how only a few people got the chance to play it -- as well as the fact that nobody can play it now if they don't already have it -- we have to ask, is Cat Girl Without Salad: Amuse-Bouche really worth talking about? Definitely. Because WayForward did their absolute best to turn an exaggerated joke on game design into a reality, and they actually pulled it off pretty well. Simple controls, simple plot, and tight design. Cat Girl Without Salad: Amuse-Bouche follows the exploits of Kebako, an Intergalactic bounty hunting Cat Girl with a big smile, a bigger appetite, and a short attention-span and her partner Squiddie as they attempt to capture several high-price bounties while slowly piecing together Kebako's past. Although, Kebako doesn't really care all that much about that last part; she's too busy eating junk food and shooting through waves of space baddies. While the story and dialogue are written mostly for comedy's sake, and the world in which the game takes place is ridiculous, the writing actually manages to create an interesting and cohesive universe through small tidbits of absurd exposition. Almost all of the game's dialogue is delivered during gameplay. Character portraits are put up on either end of the screen for added visual expression, and each character has their own color of subtitles to make the conversations easy to follow during intense shooter battles. Neither aspect of the game ever overshadows the other. That's right. Cat Girl Without Salad is real life. The game provides a tutorial that explains all the controls the first time you start a new game and then never again. Thankfully you won't ever need to see it again, because the game's mechanics are straightforward enough that anything you might forget can easily be learned again through play. While the game is decently challenging, and players may find themselves trying boss fights and even whole levels over again. The degree of challenge is still far lower than that of a typical 2D shooter. The controls are tight and simple, and work in conjunction with very distinct visual design. Hit-boxes are clearly-defined to allow for a frantic and colorfully explosive shmup that's hard, but still fair. The screen can become dense with enemies and obstacles, but visual complication is rarely ever an issue, keeping gameplay far from being frustrating. You must always go without salad, but not without garnish. What truly makes Cat Girl Without Salad: Amuse-Bouche stand out from other 2D Shooters -- and other games in general -- is it's in-your-face presentation. Everything from the game's weapons, to it's characters, to it's enemy and level names wants to grab you by the collar and scream in your face, "GET EXCITED!" Starting off with what is probably the most unique aspect of the game, we have the weapon power-ups. The basic weapon that you start with at the beginning of every level isn't the strongest, but it is more or less possible for you to manage the enemy threat well enough to stave off death with nothing more. But you would be missing out on a lot if you were to ignore the power-ups, as they are some of the most creative ever seen in a 2D shmup. Fan-made weapon cartridges. Image credit of "Nightmare Bruce" on ribbonblack.com. All weapon upgrades in Amuse-Bouche take the form of game cartridges similar to those used for the Nintendo Famicom, and all of them grant Kebako a gun representative of a completely different genre of video game. The Dance Gun makes it so every shot is made more powerful if the player's input matches the DDR-esque arrows on screen, while the RPG gun gives a variety of options from a Final Fantasy styled menu, and so on. These guns are simultaneously an amusing novelty upon first discovering their mechanics, while also all being varied editions of a clear improvement on your basic weapon. This allows the gameplay and the overall spontaneous tone of the game to exist hand-in-hand. Kebako using the "Sports Gun", which fires bouncing golf balls around the screen. 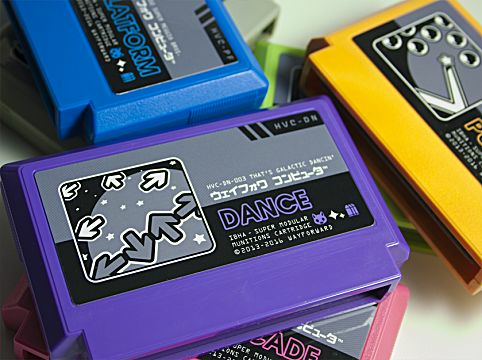 The hand-drawn sprites are both vibrantly colored and stylistic, despite their simple animation cycles. If the backgrounds ever repeat themselves, it's hard to tell. The visual style both takes inspiration from as well as riffs 80's culture, anime, and video games of all sorts. It then takes all of these different visual elements and blends them together into a colorful and expressive celebration. In keeping with the game's tasty title, all of Amuse-Bouche's healing items are food. You must "go without salad" as the game puts it. All food will heal one heart worth of damage, with the exception of salad, which deals one heart worth of damage. It is also the only non-junk food of the bunch, as well as the only food that isn't smiling. In terms of audio design, the sound effects are all distinct, and sound appropriate for their corresponding actions. The soundtrack is a short but nonetheless catchy selection of tracks of varying musical genres, typical of the usual style of composer Jake Kaufman (Shovel Knight, Shantae series, Double Dragon Neon, etc). Click here to hear for yourself. The biggest negative of Cat Girl Without Salad: Amuse~Bouche is it's extremely brief length. The game only has three levels to speak of, and if the player is good enough it can be be beaten in little more than an hour. Despite this, there is a decent amount of replay value present for a game so short. There's a high score system for those looking to track and improve their performance. There are variables that make each playthrough slightly different in terms of item drops. And, there is an option at the end of each level that results in two different bits of dialogue. So there are reasons to replay what little there is. Unfortunately, Cat Girl Without Salad: Amuse~Bouche is a game that is, at this time, impossible to recommend, as the game is not currently available for purchase anywhere. As previously mentioned, it was sold as a Humble Bundle Original as part of the June 2016 Monthly Bundle, and there is currently no way to obtain the game outside of having been subscribed to the service at that time. It's possible that the game may be released elsewhere in the future, but for now, it's a game that most people will have to watch somebody else play instead. However, this might not be the end for the series. 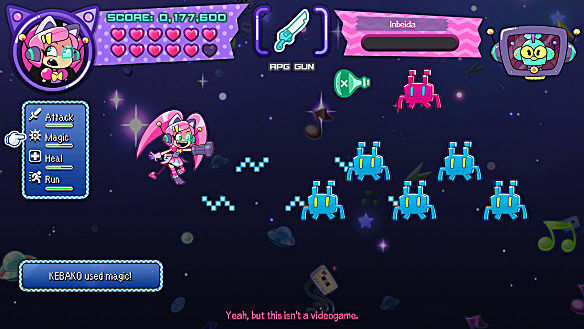 It also appears that this may just be the first installment in a planned series by WayForward. According to the game's official site, Cat Girl Without Salad: Amuse-Bouche is described as "the first taste of an exciting new game franchise". So it's possible that there could be future entries in the Cat Girl Without Salad series. Perhaps those will be available for regular purchase. It would be nice to see it return, as it brought some new and creative ideas to the table, and could hopefully bring even more. As it stands, Cat Girl Without Salad: Amuse-Bouche is a fun, unique, and irreverent way to spend an afternoon, and it would easily receive a recommendation if one were possible. The game everybody asked for. The game nobody knew about. The game nobody played. The game everybody should play. If they could, that is. Cat Girl Without Salad: Amuse-Bouche And Many More Now Available Through New "Humble Trove"